Since 1979, the United States has looked at Iran as an enemy, and made all possible efforts to prevent the country from extending its influence past its geographical borders. The US supported Saddam Hussein’s regime during the 1980s Iran–Iraq war to stop Tehran from again becoming a great regional power. Later, when Saddam became a threat to American interests in this region, especially after his invasion of Kuwait in 1990, the US decided to topple him. In 2003, the US invasion and subsequent occupation opened a Pandora’s box of violence and turmoil that has yet to be closed. Iraqis, glad to have rid themselves of a dictatorship, are now facing a different challenge: the Iranian–American battle over their rich land. Both of these powers were accused of helping foment the civil war in 2006 that cost many Iraqi lives, and they are now to blame for leading Iraq to the brink once more. Iraqis will no longer tolerate others turning their country into an arena for settling regional and international scores. As such, Iraq’s political elite must take it upon themselves to secure their country’s independence from foreign backers. Iranian Foreign Minister Mohammad Javad Zarif made an extended visit to Iraq in January 2019. Unlike American representatives, he was able to move freely and safely in Iraq’s cities, demonstrating this when he visited Baghdad, Erbil, Sulaimanya, Najaf and Karbala. He met with tribal elders, religious leaders and militia fighters. Zarif wanted to send a clear message to the Americans: Iraq is our backyard. Zarif implicitly stated that Iran intended to stay in Iraq while the Americans would have to leave. Through combative rhetoric he tried to mobilise those Iraqis for whom this ‘resistance’ narrative resonates. Some observers have noted that Iran is working to win Iraqi ‘hearts and minds’ as it considers this the basic cornerstone for its broader geopolitical strategy. Due to the strong American support for Israel in its conflict with the Palestinians, and the destruction wrought during the war and occupation of Iraq, the Iraqi Shi’a community considers the US an enemy, and as such the Iranians are keen to use their relations with this community to oppose any US presence in the country. Zarif, for the first time, talked about a new Iranian project in Iraq. He noted that his government would support policies to improve the standard of living in Iraq. Iran would also take steps towards enhancing Iraq’s economy for sustainable development. 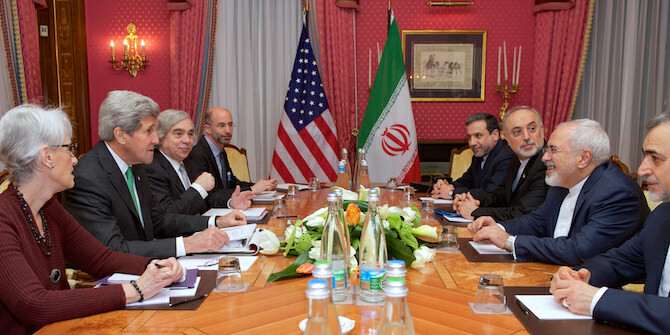 Cooperation with Iraq on a nuclear energy programme was also to be a priority for Tehran in the years ahead. It seems that Iran realised too late that its policies in Iraq had been poorly conducted, for which it has paid a heavy price. Iraq is no longer a stable country, nor has it any ability to face significant security and economic challenges. Without Iranian/American assistance, it could not have ended the war against IS. However, the burgeoning Iranian–American conflict will lead to more chaos in the country. Thus, Iraq’s policymakers urgently need to think twice about how to find a way out of this stalemate. Otherwise, we are approaching a bloody phase that hearkens back to the dark days of 2006–7. When US Secretary of State Michael Pompeo visited Baghdad on 9 January 2019, his conversations with Iraqi officials revolved around the American view of Iraq’s situation. He met with new Iraqi Prime Minister Adel Abdul-Mahdi, and many sources indicated that he warned the Iraqi government that the Trump administration would not permit the Popular Mobilisation Forces (PMF) to assume overall security responsibilities in Iraq. The prime minister was instructed to solve this problem as soon as possible. Pompeo further informed Abdul-Mahdi that Israel was poised to attack the PMF in western Iraq, and that Washington would not act to prevent this unless Iraq did not acquiesce to US demands regarding dissolving the PMF. Pompeo noted that though Iran had withdrawn its troops from Syria, its allies were still deployed in al-Anbar and western Mosul. These troops are mobilised and trained in Iraq, and are now spreading along the Iraqi–Syrian border. The White House is worried that this will result in shifting the balance of power in favour of Iran. Geopolitically, this area is important, acting as a corridor to connect the territories of what is called ‘the axis of resistance’. It contains the highways connecting Iraq with its neighbours, Syria and Jordan. It is furthermore one of the zones where IS first emerged, before going on to extend its hegemony over 40 percent of Iraq’s territory. Additionally, it is at the heart of the Chinese plan for the ‘New Silk Road’. If others can successfully assert their dominance in this area, the US and its partners stand to lose a lot. As such, it is expected that the US will focus on ejecting the PMF from its bases in this region. Pompeo, in this context, insisted that if his country’s embassy in Baghdad were assaulted, American troops would attack the PMF’s headquarters in Baghdad. This means that war is looming. As the new prime minister assembled his cabinet and began to lay out his priorities for the years ahead, Iraq was the centre of world media attention. Many top foreign and Arab leaders visited, with French Minister of Foreign Affairs Jean-Yves Le Drian among them. Le Drian went to Najaf, Iraq’s Shi’a cultural and political centre, and met with its religious figures. His message emphasised the seriousness of the situation on the ground and reiterated that IS remained a threat that all parties needed to work together to counter. It seems likely that Le Drian attempted to convince the Shi’a clerics to release a fatwa to call for the dissolution of the PMF. During a Friday sermon a Shi’a clergyman, Mohamed Mahdi al-Khalissi, did call upon the Iraqi government to disarm and demobilise all paramilitary groups, for which, in exchange, it was to legislate a parliamentary act mandating the withdrawal of all foreign troops from Iraq. There is no sign that the US would accept this equation, and nor would the Iranians. The Americans fear that Iran will fill the vacuum after their withdrawal from Iraq. Iran worries that the dismantling of the PMF would mean losing a key ally with influence over Iraqi politics. Iraqis, for our part, ought to produce more options to settle this tension if we want to avoid the threat of further war in our country. In the end, this is the primary function of our politics: to find such a solution.